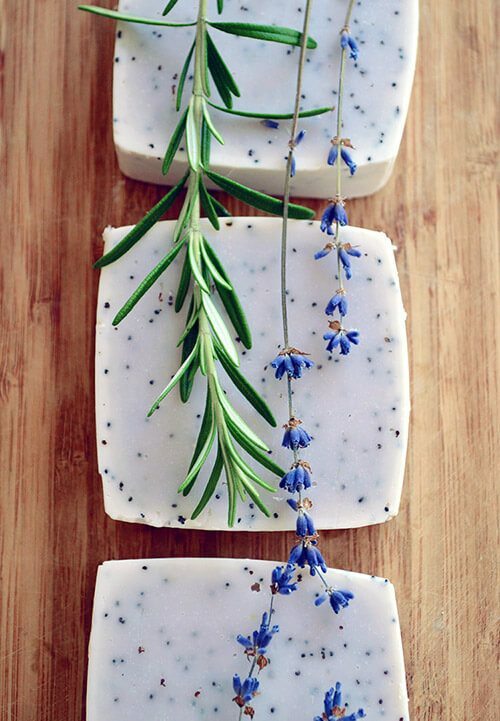 Many handmade soap recipes focus on creating luxurious bars for the whole body but really what part of you do you wash the most? Hands! 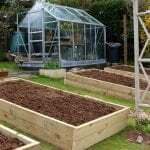 Especially if you’re a dedicated kitchen gardener. 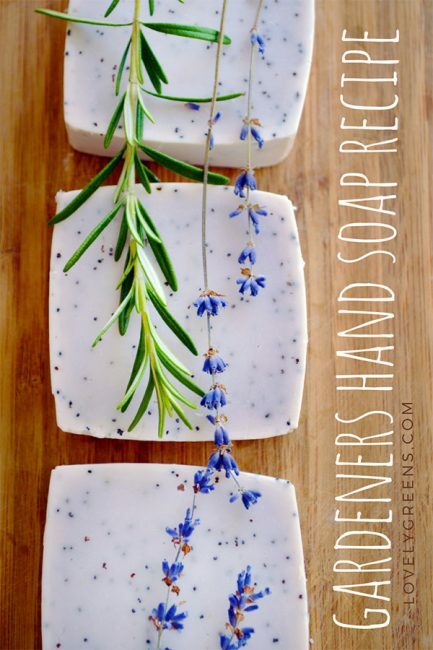 This recipe for lavender and rosemary scrubby hand soap is great for cleaning dirty hands and nails without stripping your skin of moisture. You can even use a bar of it to make your own liquid hand soap if you’d like. The batch is for one pound (454g) and is enough to fill one plastic take-away box, giving you five stubby bars, or a paper milk/juice carton, which will give you four decent sized square bars. I prefer the latter since the shape is both rustic and pleasing, making them ideal to use at home or to give as gifts. Use the instructions in the above links to make the recipe. 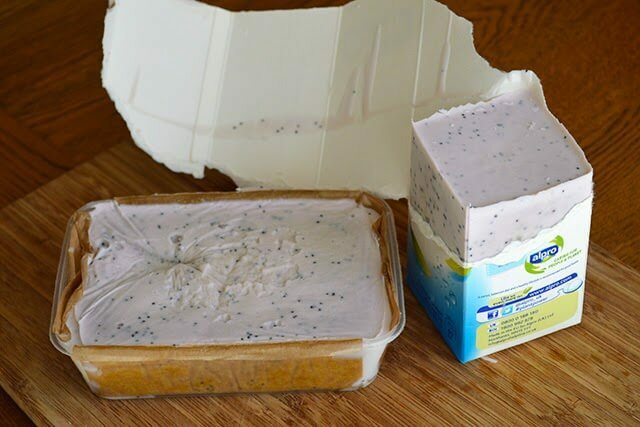 You can use practically any paper or plastic container as a soap mould though and I’ve seen others use margarine containers, yogurt dishes (for round soaps), and even cardboard boxes for larger batches. In fact, I know of a professional soaper who uses USPS boxes to make her soaps. The positive thing about using recycled containers as moulds is that you spend less money on your handmade soap, you give a container that might have otherwise ended up in the landfill a second chance at usefulness, and lastly, you don’t have to worry about not destroying it getting your soap out. 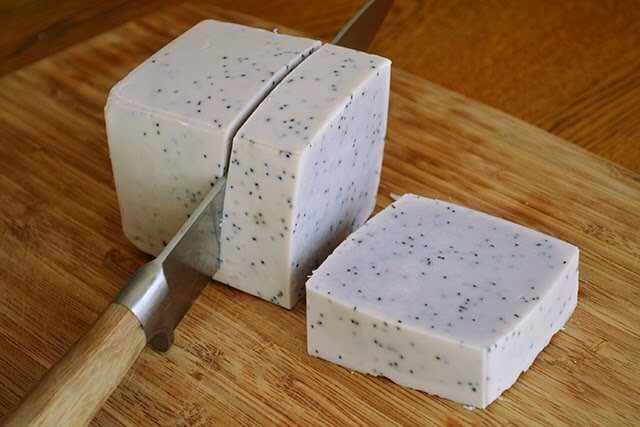 Follow the soapmaking instructions in this post and don’t forget to also check out what equipment you’ll need to make soap. The temperature I mix oils and lye-water together for this recipe is 120 degrees F and once you’ve poured your soap into the moulds make sure to insulate them really well with towels or blankets for at least twenty-four hours. Also, cover the tops of your soap with plastic wrap if you think they might come into contact with fabric during the time they’re insulated. It’s hard waiting for the soap to cure, but try to forget about it and mark the ready-by date on your calendar. Use it to your heart’s content after this point and make sure to make enough to give to friends. I can guarantee that in the month between you pouring the soap and the time it’s ready that you’ll have a waiting list of friends and family wanting to try your handmade creation! 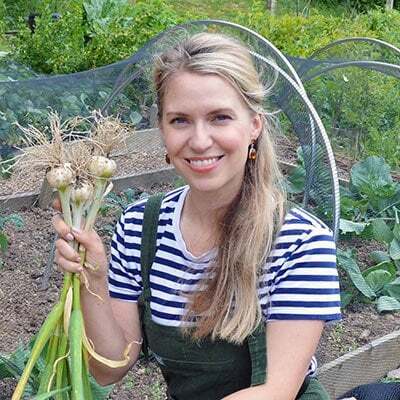 For those interested in this recipe but not able to make your own batch for a bit, I offer a Kitchen & Garden hand soap through my online shop. It’s similar to this recipe but uses pumice stone for the scrubby bits and combines Rosemary essential oil with citrusy Citronella. 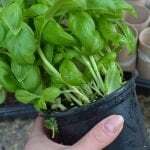 It’s very popular and helps remove dirt, grime, and strong scents such as onions and garlic. It’s also highly moisturising and strong enough to cleanse and condition the grubbiest of hands. 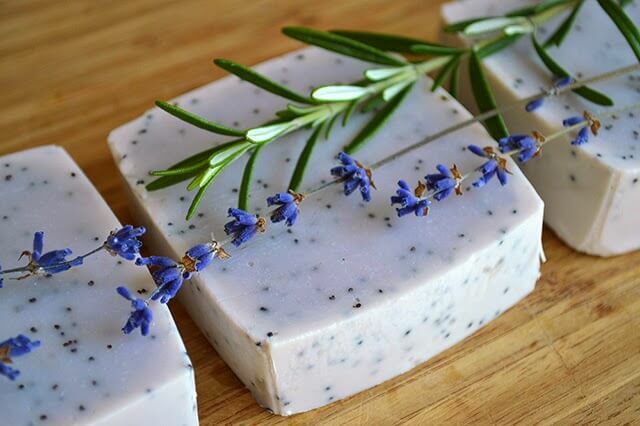 Could you confirm the amount of lavender mica to use in your lavender and rosemary soap recipe? Is it an eighth of a teaspoon? Or 1 to 8 teaspoons? Thanks Tanya. On day off i tried to make a cream ” Wild rose & Honey Hand Cream Recipe” by your recipe , it was really very cool the cream is very absorbed into the skin does not leave fat as i have oily skin and i tried it on my face on body and it’s really super)) it’s my first cream by your recepe!!!! Now i want to do more. But i have a question how to understand which emulsifier to choose for a cream by what principle and if is differences for face or bođy. For example i understand that there are emulsifiers especially for water \oil and oil\water. But for example i would like to do cream Oil\water and there are a lot of emulsifiers and i cant undetstsnd what kind of them will be better for cream , how can i oriented in them. It’s entirely personal preference. However, oils are subject to both heat and caustic soda in soap making so I like to reserve my better oils for lotions and creams. Refined oils are also more costly and have a stronger scent which is why I always use refined coconut oil in my own recipes. Thank you so much for the lovely recipes!! Hi, thanks for the recipe. I just have one question can I use Lavender butter for this recipe? 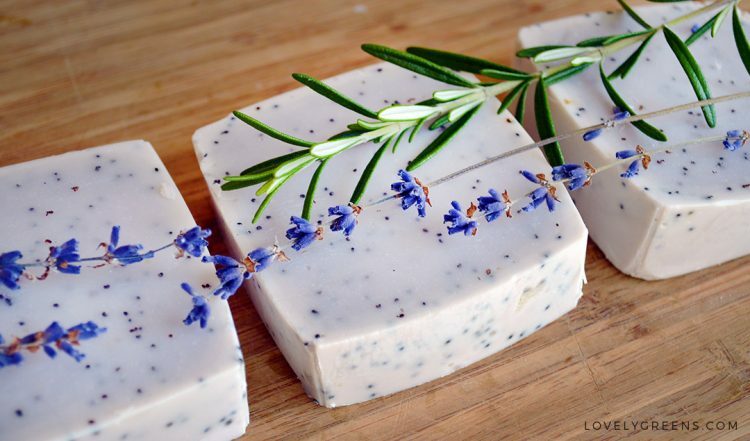 or for the other Lavender soap recipe you share with us in your post “Natural Soapmaking for Beginners – Basic Recipes and Formulating Your Own”. If I can, how do you sugest to integrate this new ingredient in the recipe? I’m unfamiliar with Lavender Butter – could you provide more specific information on what it is? What ingredients is it made with? 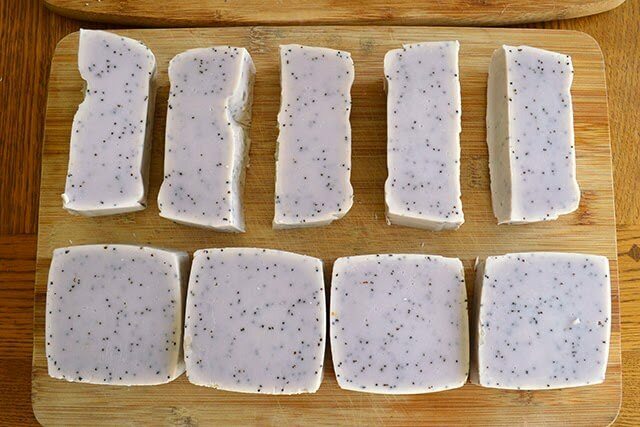 Hi Tanya…I would really like to give this a try….is it possible to get small amounts of the ingredients needed so I only have enough to make this batch of soap?? Or maybe you sell them as a sort of 'have a go starter kit' on your site for people who would like to give it a go?? I have long wanted to learn soapmaking, but it seemed a little daunting. Your recipe and instructions make it sound doable. This particular soap looks gorgeous and I love scrubby soaps. Can't wait to try it! Beautiful photos, too. Rodemary and Lavendar I adore those two and I buy soaps of this kind when I got a little bit of money they are not cheap in Washington state, I ususally find mine in Seattle where the taxes take a big bite out of any purchase but they are worth it as in my tiny town they are not to be found..I use them after I garden and anytime I need to mini scrub my hands without taking the skin off and they smell so good! thanks for the recipe I will try to make them and give them to very special friends only. happy Passover and happy easter! ciao!